The mass shooting happened during morning services at the First Baptist Church in Sutherland Springs, a small town in the countryside more than 30 miles southeast of San Antonio, and it claimed the lives of people ranging in age from 5 to 72, authorities said. A gunman shot and killed more than two dozen people and injured many others Sunday inside a small community church here in South Texas, and he was found dead several miles away from the scene after fleeing, authorities said. Witnesses described the shooter as a man in his 20s wearing all black clothing and a tactical vest. Neighbors said they heard loud bangs and even had bullets spray into their homes as the gunman released a barrage of gunfire that started outside the church and moved into it before noon. "At this moment in time, there are 26 lives that have been lost," Texas Gov. Greg Abbott said during an early evening news conference. "We don't know if that number will rise or not, all we know is that's too many and this will be a long, suffering mourning for those in pain." According to a statement from the Texas Department of Public Safety and Wilson County Sheriff Joe Tackitt, officials were called to the church for reports of a gunman at 11:20 a.m.
Officials said that the suspect - who they said was a young white male in his 20s - began firing a Ruger assault rifle outside of the church and then entered the building as he continued to fire. Authorities said that as the gunman exited the church he was confronted by a local citizen who, armed with his own weapon, began firing at the gunman - prompting the suspect to flee in his vehicle. "The local citizen pursued him," said Freeman Martin, a regional director for the Texas Department of Public Service, who said the gunman crashed off of the roadway about 11 miles north of the shooting scene. "We don't know if it was a self-inflicted gunshot wound or if he was shot by our local resident who engaged him in a gunfight." Twenty-three people were found dead inside of the church building, two people were shot and killed outside, and one additional person died at an area hospital, authorities said. Two law enforcement officials told The Washington Post that the suspect has been identified as Devin Kelley, 26, a Texas man who lived in a nearby county. Those officials did not see any immediate sign that he was motivated by international terror groups, but they cautioned the investigation is still in its early stages. Authorities had not yet provided any information about a possible motive for the shooting as of Sunday evening. Central Texas was swarming with law enforcement officers Sunday afternoon, as officials worked both the scene of the shooting and the scene where the shooter was found. An official with the San Antonio Police Department said their bomb squad was dispatched to search the shooter's vehicle for explosives. Authorities said they found multiple weapons in the vehicle. Federal authorities, including from the Bureau of Alcohol, Tobacco, Firearms and Explosives and the FBI, are on the scene. The Texas Ranger Division of the state's Department of Public Safety also is involved in the investigation. Diana Segura, 69, was in the shower Sunday morning at about 11 a.m. when she was startled by a series of thundering bangs so loud she thought a truck's engine had exploded on the highway behind her home. Minutes later, sirens burst onto her quiet street and Segura walked outside and saw the unthinkable: multiple bodies on the ground outside the First Baptist Church, where she occasionally attends weeknight services. Standing outside her home down the street from the church, Segura stared at the throng of police cars and emergency vehicles, her head shaking in disbelief. "This is a small town and nothing never happens here," Segura said. "We are family here, and that church is always filled with friends." Megan Posey, a spokeswoman for Connally Memorial Medical Center, located not far from the church, confirmed that the hospital is still accepting patients from the shooting, though she does not know how many. Frank Pomeroy, the pastor of First Baptist Church told ABC News that his teenage daughter is among the dead. Dana Fletcher, who owns a business a quarter of a mile from the church, said she and her family just moved to Sutherland Springs. She said she was first alerted of the shooting after receiving a call from a reporter. "My husband and I both are still in shock," she said. "It's a little tiny church that was targeted. It's shocking. It's a bit frightening because it's a little bit close to home." The shooting Sunday came more than a month after a masked gunman stormed into a small community church outside of Nashville and shot seven people, including the pastor, killing one. Authorities said the suspect in that shooting, Emanuel Kidega Samson, might have been motivated by a quest for revenge for a 2015 shooting that targeted black churchgoers in Charleston, South Carolina - a shooting that left nine people dead. It also came just more than a month after 58 people were killed at a Las Vegas country music festival, in what was the deadliest mass shooting in recent U.S. history; the assailant, Stephen Paddock, killed himself after a lengthy shooting spree from his 32nd floor Mandalay Bay hotel suite. President Donald Trump, who is traveling in Asia, said in a tweet Sunday afternoon that he is "monitoring the situation from Japan." White House press secretary Sarah Sanders said Trump has spoken with Gov. Abbott and is receiving regular updates on the investigation. "May God be w/ the people of Sutherland Springs, Texas. The FBI & law enforcement are on the scene. I am monitoring the situation from Japan," Trump wrote. Texas Attorney General Ken Paxton said in a statement that his office stands ready to assist local law enforcement as needed: "The thoughts and prayers of all Texans are with the people of Sutherland Springs as tragic reports come out of First Baptist Church." 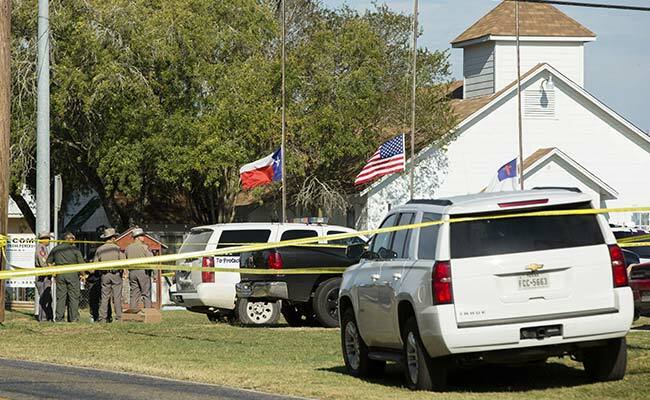 Texas Democratic Party Chair Gilberto Hinojosa also confirmed that multiple people were gunned down in the church. "The facts of this horrific mass shooting are just beginning to unfold, but one thing is certain: these tragedies are especially terrifying when they happen in places of worship, a sanctuary and comfort for so many," Hinojosa said. A video shared on Twitter by a KSAT reporter showed people crying and holding hands as they waited to find out whether their loved ones are safe. Carrie Matula, who works at a gas station near the church, told MSNBC that she ran out to see what was happening after hearing gunshots. "I never thought it would happen here," she said. "This is something that happens in a big city. I would have never thought this would have taken place here. It's just too tight a community. It doesn't make sense." The church is a part of the Southern Baptist Convention, the largest Protestant denomination in the country with about 15 million members. First Baptist reported an average estimated attendance of 100 in 2015. The church is affiliated with the Southern Baptists of Texas Convention, considered one of Texas's more theologically conservative group of Southern Baptists. Mike Jordan, 50, was a few miles outside of town Sunday when he received a frantic call from his son telling him he needed to come home immediately. Jordan, who lives across the street from the church, said one of the shooter's bullets went through the window at his son's home, missing his two-year-old grandson by about four feet. "That curdled my blood," Jordan said. "He ran to the door and yelled to his wife, 'Get the baby, run to the bathroom. Somebody is shooting up the church!' "